I made her her first jewelry headband - with my ROSE design, but instead of using 24ga wires, I opt-ed for 26ga wires to produce a smaller wired-rose as result. I did not photograph the making process, though it's pretty straight forward. 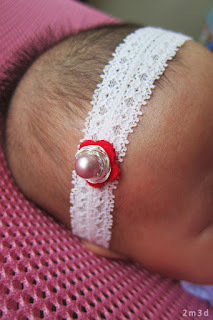 The initial plan was to use Gaussian ribbon, with that, i attached a small piece of elastic band onto the ribbon, it turned out pretty decent too but when I wore it on my baby's head, it left her a mark showing that it was too tight. 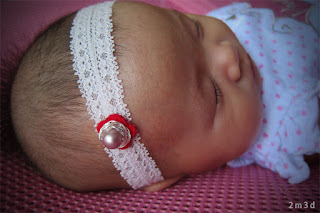 So I decided to ditch the ribbon and go for elastic lace instead - I am glad that it turned out to be totally comfortable, baby didn't even notice the headband until she accidentally touches the ROSE when she was moving her hands and legs (and then yes, she kept touching it with her little hand that's still in mitten, lol.). 2. Cut a small piece of red color felt according to ROSE's shape. 3. Measure and get baby's head measurement. 4. Cut 2 strips of elastic laces 3cm shorter than baby's head measurement. Let say your baby's head measurement is 38cm, cut 2 strips of 35cm. 5. Put both elastic laces together and make a circle, stitch them up at the lace's ends. 6. Fold them up to get the center of the headband, stitch the ROSE charm onto it. Hope you have fun trying too! This is pretty.. nothing beat creation with love by a mom! Congrats on your new born!